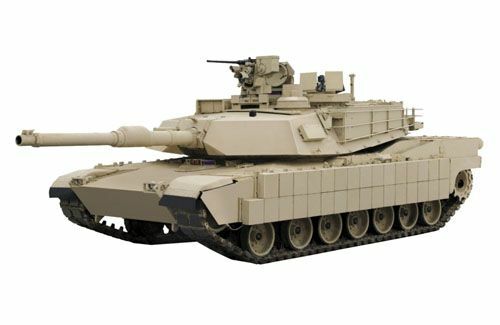 General Dynamics Land Systems has been awarded $31 million by the U.S. Army to begin upgrading 24 M1A1 Abrams main battle tanks and 22 M1A2 System Enhance Package (SEP) Version One (V1) tanks to the M1A2 SEP V2 configuration. General Dynamics Land Systems is a business unit of General Dynamics. So, one may ask, why is an automotive site writing about tanks? Well, isn't this the ultimate vehicle most of us could hope to drive? Come on, who among us (who hasn't served in a military tank division) hasn't fantasized about driving one of these bad boys? After all, it's the ultimate jet-fuel powered funny car when you think about it. According to this history on Wikipedia, "The M1 Abrams is a third-generation main battle tank produced in the United States. It is named after General Creighton Abrams, former Army Chief of Staff and Commander of US military forces in Vietnam from 1968 to 1972. Highly mobile, designed for modern armored ground warfare, the M1 is well armed and heavily armored. Notable features include the use of a powerful gas turbine engine (fueled with JP8 jet fuel), the adoption of sophisticated composite armor, and separate ammunition storage in a blow-out compartment for crew safety. Weighing nearly 68 short tons (almost 62 metric tons), it is one of the heaviest main battle tanks in service. "The M1 Abrams entered U.S. service in 1980, replacing the M60 tank. It served for over a decade alongside the improved M60A3, which had entered service in 1978. The M1 remains the principal main battle tank of the United States Army and Marine Corps, and the armies of Egypt, Kuwait, Saudi Arabia, Australia, and Iraq in 2010." As General Dynamics pointed out in its announcement, "The most technologically advanced digital tank available, the M1A2 SEP V2 includes improved color displays, day and night thermal sights, auxiliary power and a tank-infantry phone. The configuration is a digitally connected tank with a state-of-the-art electronic backbone, powerful computers and an open architecture designed to accept future technologies without the need for significant re-design. The SEP enhancements make the Abrams the most survivable tank in the world and enable it to fight as part of the Joint Force network for decades to come." The order authorizes the modernization of tanks that have been in the Army's inventory for up to 20 years. Work will be performed in Anniston, Ala.; Tallahassee, Fla.; Sterling Heights, Mich.; Lima, Ohio; and Scranton, Penn., with an estimated completion date of November 30, 2014. Think of this as a mid-generation refresh. Granted, tank generations are a lot longer than automobile generations, but it's good to see our fighting troops equipped with the best equipment possible whenever possible. This award maintains the stability of the U.S. combat vehicle industrial base and helps protect critical commercial defense resources. Abrams production helps preserve a strong national industrial base of approximately 882 suppliers, 64 percent of which are small businesses, as well as a strong national defense. General Dynamics Land Systems is a manufacturer of wheeled, tracked and amphibious combat vehicles, offering a spectrum of design, production and lifecycle support to customers worldwide. Its portfolio of vehicle platforms includes the Stryker wheeled combat vehicle, the Abrams main battle tank and the MRAP class of tactical vehicles. Has it got a 'hemi?